This week I attended a presentation by my good friend and professor of political science at the University Copenhagen Peter Kurrild-Klitgaard about the upcoming US presidential elections. In his presentation Peter presented some of his models for predicting the outcome of US presidential elections. Peter’s thesis is that what determines the US presidential election primarily is the economic situation in the US in the 8 quarters prior to the election. Peter’s models are inspired by Douglas Hibbs’ so-called “bread and peace” models. If Peter is right – and I think he is – then the US president and his party will have an incentive to manipulate the business cycle to peak just prior to the elections. This is of course also is what inspired a large theoretical and empirical literature on the so-called political business cycles (PBC). Most PBC models focus on fiscal policy. In William Nordhaus’ traditional PBC model the government would increase public spending and/or cut taxes prior to the elections and as Nordhaus assumed a traditional keynesian model of the world the government would hence be able to manipulate the business cycle. The fact that Nordhaus assumed a rather naive keynesian model of the world obviously is also a big problem with the model and with the integration of rational expectations in macroeconomic models in 1980s and 1990s it also became increasingly clear that even though Nordhaus’ traditional PBC model is intuitively appealing it did not stand the test of time. The biggest problem with the traditional PBC models, however, is they disregarded the importance of monetary policy. Hence, it might be that a government or a president can increase public spending prior to an election to try to get reelected, but how will the central bank react to that? Obviously if the central bank is under political control the government can just dictate to the central bank to play along and to ease monetary policy prior to the elections. However, it is not given that the central bank is under the control of the government. In fact the central bank might even be hostile to the government and favour the opposition and in that case the central bank might actually itself be involved in manipulating the business cycle to achieve a certain political outcome which would be in contrast to what the government would like to see. In an earlier post I have described how the Bundesbank in the early 1990s punished the Helmut Kohl’s government for overly easy fiscal policy following the German reunification. This hardly helped Kohl’s government, but the Bundesbank was nonetheless unsuccessful in its indirect attempt to oust Kohl. 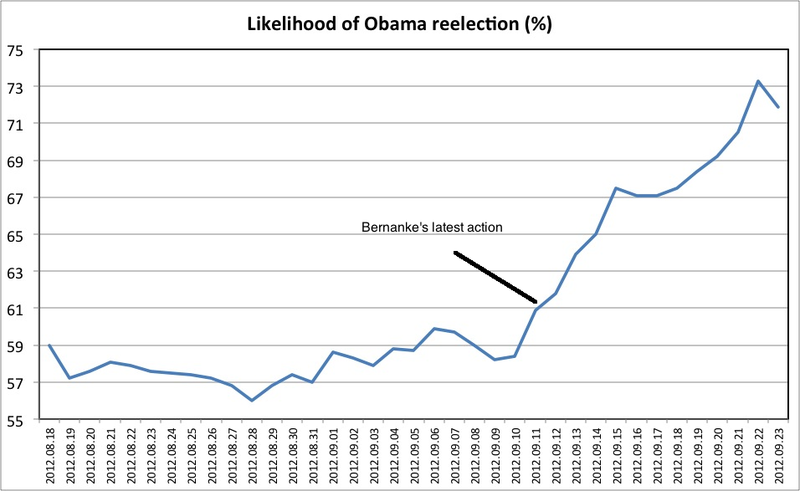 Did Bernanke just ensure Obama’s reelection? During Peter’s presentation he highlighted that political prediction markets such – as the Iowa Electronic Markets – are better at predicting the outcome of US presidential elections than opinion polls. I certainly agree with Peter on this issue and therefore one of my first thoughts just after the FOMC announced it new policy action on September 13 was to think about how this influences Obama’s reelection chances. If Peters models are right that higher real GDP growth increases the likelihood that Obama will be reelected and if I am right that I think Bernanke’s actions will likely spur real GDP growth in the short-run then the answer must be that Bernanke just helped Obama get reelected. So what are the prediction markets saying? Well, there is no question that Obama’s election chances have increased significantly in recently. Political pundits talk about Michelle Obama’s speech at the Democrats’ convention or Romney’s not too elegant comments about Democrat voters. However, both Peter and I know that that is not really what is important. To us it is as James Carville used to say “It’s the economy, stupid”. I think it is pretty clear – the Federal Reserve’s actions on September 13 have helped increase the likelihood of Obama getting reelected. Whether this is good or bad is a separate matter, but it certainly illustrates that if you want to be elected president in the US you want to have fed on your side. This is of course also why you want to depoliticize monetary policy and get it as far away from political influence as possible – if politicians gets to control monetary policy the likelihood that they will misuse that power certainly is very high. Here the keyword is depoliticize – you in general don’t want central banks to interfere in politics for good or for bad. The central bank should just take fiscal policy as a given and respond to it only to the extent that it has an impact of it’s monetary policy target. That also includes that the central bank should not punish governments for bad policies either – as the ECB seem to be doing. In the case of the present situation in the US it is therefore paradoxical that the Obama administration apparently has done so little to influence the decisions at the fed. So even though the Obama administration has appointed numerous Fed policy makers it does not look as if any attempt has been made to appoint Fed officials that would press for monetary easing – which obviously would have been in Obama’s interest (note this is an uneducated outsider’s guess…). This might be because the president’s main economic advisors are staunch keynesians who have little time for monetary policy matters. So if Obama is not reelected he might want to blame Larry Summers for past sins. It is equally a paradox that the fact that the Fed now seems to be moving in the direction of a more ruled based policy is what likely will help Obama get reelected. When I started thinking about writing this blog post I actually started out with a research idea and I want to get back to that. One of the reasons that the literature on political business cycles has not produced any general conclusions or strong empirical results is in my view that models predictions are so dependent on what assumptions are made about the institutional set-up. Is the central bank for example independent or not? Will monetary policy counteract or accommodate pre-election spending? I therefore think that there is scope for new research on particularly central bank’s institutional structures and how that might influence the political business cycle. In the case of the US and the Federal Reserve I think it would be very interesting to study how different FOMC member’s partisan affiliations influence their voting during the election cycle. Would for example FOMC member appointed by the president vote for easier monetary policies prior to presidential elections? And will FOMC members from certain Fed districts vote in a way favorable to the dominant political affiliation of the given fed district? PPPS Obviously the best way to avoid political business cycles is a strongly rule based monetary policy – such as NGDP level targeting, fixed exchange rates, a gold standard or free banking…some of these options I like better than others. Obviously, I am more inclined to believe the markets than a political scientist …;-) That said, prediction markets are not always right, especially about politics. Off the top of my head they have called several VP-selections wrong, the 2006 mid-term election and the recent SCOTUS ruling on Obamacare. The average error of the markets in predicting vote shares in presidential elections are no better than opinion poll averages. I could also Cover My A.. by saying that the standard errors of the econometric models are such that they do include an Obama win as a possibility. But it is tricky with the measuring monetary easing. One possibility of course would be to look at actual monetary policy relative to some “optimal” rule – for example looking at interest rates (the fed funds rate in the US) relative to what for example the “prediction” of a Taylor rule. That of course would not be useful in the present environment with interest rates at the zero lower bound. Furthermore, as expectations is extremely important in terms of understanding monetary policy it important to look at the communication from the central bank. Hence, it was for example Bernanke’s announcement of QE2 in August 2010 that was important for the economy and markets rather than the actually implementation of the policy. I am pretty sure that if we look at clear monetary policy announcements in the US of the paste four years it will be fairly correlated with changes in the popularity of Obama. I don’t really know if Obama did or didn’t interfere with the Fed. I have heard some disagreement with the way easing works coming from the left. They have a problem with bankers/rich asset holders getting new money to invest, and would rather easing be done so that government spends the money instead – but that is politically impossible.There is also a rather cynical view that if there were more people needing government assistance, that would make more people inclined to vote Democrat and thus be a reason for not pressing the Fed to change course, or perhaps not letting the Fed do what needed to be done. Romney seems to lean toward this view given his 47% comments, but I don’t really buy it. There was also a poll out by Rasmussen that shows 60% of Americans believe George Bush and Republicans are responsible for the economic mess, and almost as many believe that the recession was so deep it will take years to recover. These people don’t know there are things Obama could have done and failed to do to get a faster recovery and it appears that it is an Obama advantage. I am just pointing out possible reasons that what the Fed was doing (or rather not doing) point to an Obama advantage, and so it is difficult to tell whether Obama had a hand in it or not, or why he might not have been in such a hurry to fill the empty seats on the BoG. It might be that he is just incompetent, or was receiving advice from incompetence; it just all depends on if one is willing to extend the benefit of the doubt. I am not suggesting that Obama influenced the latest decision from the fed or that the fed did it to improve Obama’s reelection campaign. I rather use the example to show that if we want to think about political business cycles when we need to think about monetary policy as well. In fact it is incredible that the Obama administration – apparently – has done so little to influence the fed’s conduct of monetary policy. Especially given the fact that the GOP has done a lot to threaten the fed not to ease monetary policy. Just take Romney’s threat to sack Bernanke or Rick Perry’s allegation against Bernanke for having committed treason. This is actually an argument for what I was saying – the opposition can also use monetary policy if they control the central bank. Hence, from a political business cycle perspective it has clearly been in the interest of the GOP that the fed has not eased monetary policy enough to ensure a proper recovery in the US economy. Hence, in that way one might argue that Bernanke’s latest decision will help Obama, but the fed’s failures over the past four years have clearly helped the GOP. I agree. I was just pointing out some possibilities and suggesting some caution when making assumptions about what Obama may or not have done.Obama is the most energetic President authority wise, and the most ideologically statist I can remember, and he and his party are in control regardless of any overt things Republicans might be doing. Republicans are not really that good at politics and generally do more harm to themselves when they try to play the game, and so I wouldn’t be too quick to assume their overt pressure on the Fed had anything to do with the outcome, but was rather just exasperation about being completely powerless. I can’t help but notice the “Likehood of Obama reelection” look like the profile of a face of someone looking benevolently down on the situation. Perhaps Bernanke? Obama? (Sorry not to be more on topic but I couldn’t resist). I very much agree however with your and Peter’s assessment on monetary influence, and that ‘Bernarke (unintentionally) is likely to win Obama an election’. And your proposed line of research is fascinating – had I had the tools and knowledge, I’d be happy to take part. Thanks Robert…I do agree that there is no simply explanation here. My view however is that political commentators in the popular media focus far too much on personality issues rather than simple socio-economic explanations.